Tagged Awesome, M is Correct, Midpoint Music Festival, Mystery Palace, Pomegranates, Robert Pollard, The Mocks, WHY? Cincinnati: On the Up and Up! Holy awesome, look at that podium! I’ve never seen that! OK, sorry I got distracted. The news about Cincinnati has been giving me a lot of hope lately. When you make the decision to return somewhere, especially when one reason is you seeing a lot of potential in the place, you like to see news that validates it. From City Beat’s refusal to buckle under CCV‘s pressure to the beginning of downtown’s revitalization and even to the American Screenwriters Association’s decision to set up base here , I’ve been seeing a lot of wonderful things since I’ve been back. Go tomorrow! Koala Fires! Bad Veins! Pomegranates! Free! So, here’s a thing to do tomorrow. All the info you need is on the flyer, and you ought to be there the whole time. Everything about the line up is good! How can you say no to Corrie’s adorable band mascot. If you aren’t there, you’re a chump. P.S. I’m first in line once Corrie and Kendall’s adorableness-factory starts churning out those stuffed hits. P.P.S. 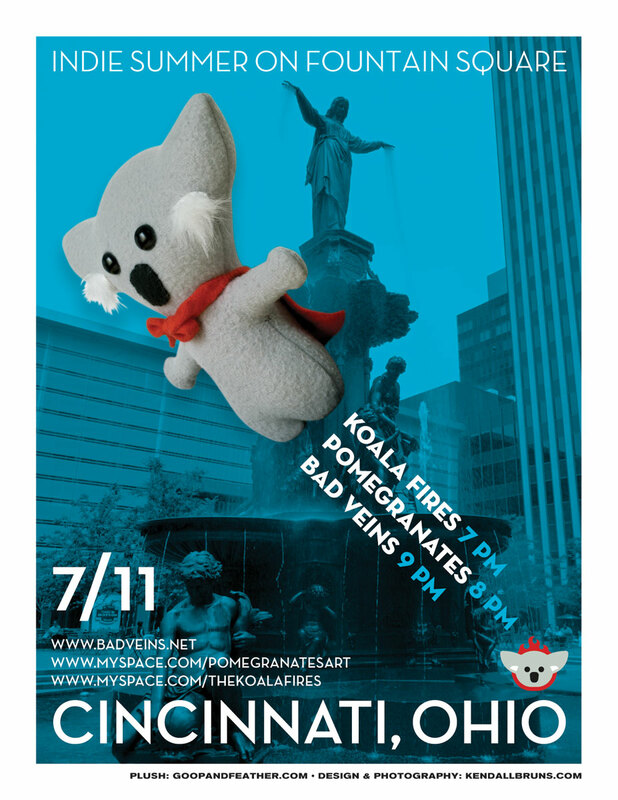 Koala Fires also play tonight at Dirty Jack’s. P.P.P.S. Support things happening downtown.